After the success of the inaugural Superkarts! USA ProKart Challenge West Coast Shootout in 2009, the concept of bringing together the best drivers from the North and South regional programs again proved worthy with an even bigger driver roster and fiercer competition this year. The Santa Maria Karting Association Kart Track played host to the second annual ‘North vs. South’ title fight – set as the final round of the six-race South championship chase while counting toward round five for the North. With 120 drivers from all over the west, the beautiful coastal weather greeted a packed paddock that was buzzing with excitement as drivers went head-to-head against their regional counterparts. In the end, the South would prevail over the North in the final tally, thanks to performances like Bobby Kelley in TaG Senior – and despite the efforts of those like NorCal star and former national champion Alex Speed – claiming the S1 Pro Stock Moto victory. The driver lineup in the S1 category mirrored the roster of the SKUSA Pro Tour, with all three series leaders on hand. While Clinton Schoombee and Fritz Leesmann were looking to help control their fate in the regional championships, Alex Speed had nothing to lose as he continues to prepare for the upcoming SKUSA SuperNationals. The qualifying session for the headline category was ended after just one-minute on the clock, due to oil on the track. It would be one minute too late, as it collected championship contenders Jason Toft and Tommy Thompson, ending their session with kart damage into the barriers. After the clean-up, the remaining drivers were allowed a second qualifying session, and jostled the pole position back and forth until Speed claimed the spot with a 46.669. Leesmann was a close second, as Brad Dunford slid into third ahead of Schoombee. The top four were separated by just eight-hundredths. The 2010 season is nearing the end, thus attention is turning to the crucial moments in the remaining events of the Superkarts! USA Central States Challenge (SCSC). The sixth round of the seven race series will take place at the new Precision Karting Center in Kansas City, Missouri on August 21-22. The facility is a 54-acre complex designed for transportation, public safety and student driver training. 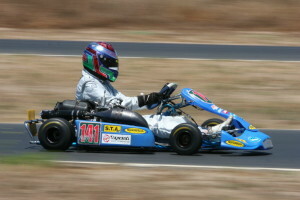 Karting has been taking place at the location since the end of 2009 with a local series running each month throughout 2010. With the combination of the local talent and the regional competitors of the Central States Challenge, the upcoming event is sure to witness great racing over the two days. ROK TT- Remove the requirement for a .1mm head shim. Change the minimum squish to .038” measured with .060” solder. Change the minimum cc to 10.8cc with LAD tool. ROTAX- Change to all RMC rules including carburetor, sealing and Passport requirement. TAG WEIGHTS- Class B changed to 370/400. At this time we have elected to retain the current weight structure for 09 Leopards; they will continue at the same weight as the earlier Leopard. Shifterkart racing is making a solid comeback this year under the focused efforts of Superkarts! USA, the racing organization that will once again bring the sport’s top drivers together in Las Vegas in November for the biggest race in the country – the SKUSA SuperNationals. There is a definite evolution underway in gearbox karting as the shift to the Stock Moto engine package continues, and SKUSA is excited about being able to bring this cost-effective powerplant to the forefront. In addition to featuring the Stock Moto program at the Rio All-Suites Hotel and Casino during this year’s SuperNationals on November 17-21, SKUSA will continue offering a category for the European-built KZ2 powerplant (formerly SuperPro), which will be opened up to more racers this year. This season’s SuperNationals – the 14th running of the event – is shaping up to be the best in its history, as entries have already surpassed the 200-driver mark. One class has already reached capacity (S4 Stock Moto Master), and a few others are closing rapidly on the limit. As such, the SKUSA room block at the Rio –which features discounted rates – is also more than half full, so racers hoping to stay at the facility should act soon by citing the special discount code when booking their rooms, as they will most certainly sell out. The SuperNationals have been in a constant state of improvement since debuting at the Las Vegas Karting Center in 1997, and this year is no different. In an effort to maintain the organization’s focus on a clear progression through the Stock Moto classes, SKUSA will be dropping the ‘SuperPro’ name for the 2010 edition of the race, replacing it with its official CIK classification as ‘KZ2’. SKUSA has verbal confirmations from the top European manufacturers that will bring to the party drivers such as reigning SuperNats champion Bas Lammers, former winner Marco Ardigo, Intrepid hotshoes Norman Nato and Jeremy Iglesias, top Tony Kart talent Rick Dreezen and current CRG factory team driver Gary Carlton, making sure that the race is once again the largest KZ2 event of the year. The title of ‘Best in the West’ will be up for grabs next weekend as the second annual ProKart Challenge West Coast Shootout will be contested at the Santa Maria Kart Track on the grounds of the pacific coast city airport in California. The August 13-14 event will pit the ProKart Challenge North series against the ProKart Challenge South program in a North versus South battle on the permanent 7/10-mile circuit. For the North, the event will count as round five of the six event program, while the South competitors will have their championships decided at the completion of the event – putting even more emphasis on the weekend. The event will see a total of 12 classes competing when combining the two programs together. S1, S2, S3, S4, S5 Junior, TaG Senior, TaG Master, and TaG Junior are classes from both regions, while G1 and S4 Magnum competitors come from PKC South and HPV2 Junior from PKC North. Rounding out the categories will be the addition of the TaG Cadet class per an overwhelming demand from racers in the area. Those in that class, along with others, will be using the Shootout to gauge their expectations for the upcoming SKUSA SuperNationals XIV later in the year, with many of the heavy hitters scheduled to be in attendance in Santa Maria.